Over the years, a black ribbon has been used as a symbol for many different causes and events - political statements, remembrance, or for mourning those who have lost their lives in unspeakable tragedies. Without detracting from any other reason for holding up a black ribbon, the Black Ribbon New Zealand Trust have added the distinct symbol of the New Zealand koru to our ribbon. 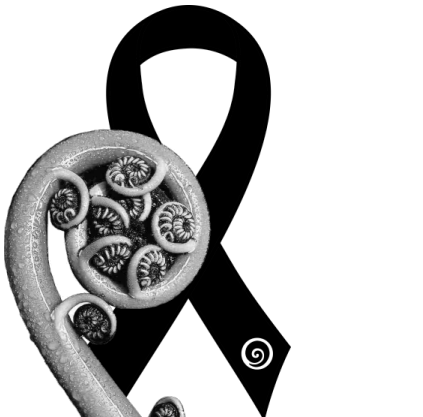 While the black of the ribbon traditionally represents mourning and loss, the koru adds the hope of a new beginning. The koru is often used in Māori art as a symbol of creation and of new life. Koru is based on the shape of an unfurling fern frond, and is suggestive of continual movement and new growth. We have chosen the koru to represent our persistent drive towards new understandings, and working together to bring peace and hope to homes and communities throughout New Zealand. New Zealand has suffered far too long, and suffered too much loss. It's time for change.